Pizza Man almost takes Cascade Classic! 2nd on GC in the 35 Masters. Down a minute and change. Won the big road stage. We're not worthy! Congrats Pizza! And yes we (I) am not worthy! Thanks Vino, what a great event Cascade is! And, you're all worthy, since I was just in the old guys race. Stage 1 TT - 15 miles with a 7.5 mile gradual climb (ave. 2.5% grade), then turn around and come down. This was my second attempt at a TT using aero bars. I had done several training rides with the bars, so I was comfortable on them the whole way. My 30 second man didn't show, so it was a while before I had someone to key on, which probably kept me from going out too fast. About half way to the turn around I saw 3 riders up the road and that motivated me to turn on the gas and I caught all 3 before the turn around. Not much happened on the way down, I just spun my 50-11 as fast as I could all the way (yes, I ride a compact ). I was pleased with my 35:00 finish time and assumed that I was probably around 10th place, but was pleasantly surprised to find that I had finished 3rd, but was a whopping 2:24 down on the leader and 1:33 down on 2nd. Behind me though it was real tight with 4th just 1 second back and the next 12 within 28 seconds. Stage 2 was a flat 6 corner 45 minute crit with 1 tight 120 degree turn. The BofA temperature gage read 94 degrees as we lined up. Being 3rd in the GC was great since it allowed me to start on the front line, which really helped since this crit was brutally fast from the start. I quickly fell back about 20 places then just settled in and stayed on a good wheel. I started the race with 9 teammates and the plan was to chase down any breaks and keep things together, but the pace was so fast for the first 15 laps that I lost about 5 of my teammates who got dropped and eventually pulled (they were given adjusted crit times). Once things settled down a bit one of my remaining teammates was able to go to the front and help chase a couple breaks. With about 6 laps to go my teammates were done and there was 1 guy off the front with a 20 second advantage, and I figured he was probably one of the guys within 30 seconds of me in the GC, so I went to the front and pulled hard for about a lap and a half. It felt real good and safe to be in front of the pack and get the HR up a little. With 4 to go, I started soft pedaling and let the real crit racers go for it. The breakaway guy held on to win, but only by 3 seconds and my pack finish gave me the same time as the rest of the main field. The crit was the real low point for our team. One teammate (Nacho Speedee on BF), who had the next best TT on the team after me was DQ’d after he dropped a chain, asked for a free lap (denied) and tried to chase, but was told by an official to come out of the race. He ignored the official and continued to chase another lap, then got pulled. Also, most of my teammates are Cat 4 and after getting shelled in the crit some were wishing they had raced in the 4's instead of the masters, but it was too late now. 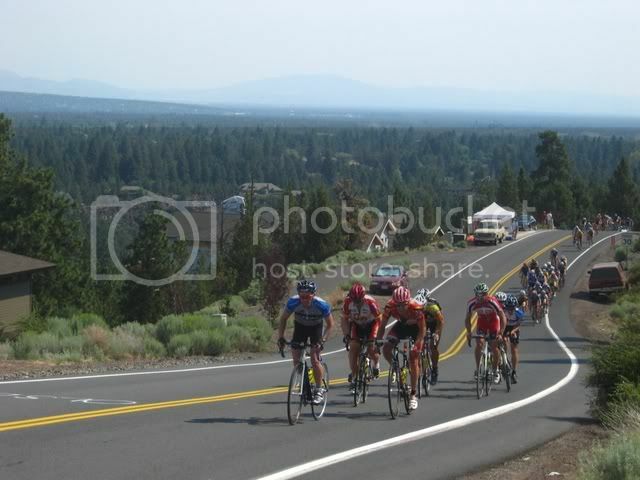 Stage 3 - 75 mile mountain road race with mountain top finish at Mt. Bachelor Ski Resort. This was the stage I had been really looking forward to since it finishes with a 700 foot, then 900 foot stair-step climb. The race plan was for my teammates to do everything they could to deliver me to the base of the final climb in the lead group without me having taken a single pull. The race started with a gradual 1200 ft climb, then a wicked 10 mile full road closure descent where I was sitting in the pack going 45-55mph all the way down! I lost 3 of my remaining 8 teammates on the first climb of the day, but had 5 strong guys to help on the long mostly flat section of the race before the finishing climb. After countless attacks were chased down, 2 riders got away about 20 miles before the final climb and as the pack settled down they were able to build a lead of nearly 2 minutes. Since the top 2 guys in the GC only had 2 teammates each who had been doing what they could to pull back the break, I had my 5 guys go to the front and start a rotating paceline. It was a thing of beauty! My teammates pulled for what seemed like 10 miles with me sitting 6th wheel the whole time and managed to pull the break back to about 30 seconds before we started the gradual climb leading to the finish. My teammates having done their work, drifted back and settled in to ride their own races the rest of the way. I was extremely grateful to them and felt the added pressure that I must win since they had sacrificed their own races for me. As the pitch increased, the climbers moved to the front and started to pick up the tempo. We caught the 2 exhausted breakaways early on the slope, then the strongest climbers attacked. For me, the toughest part of any long climb is the first 5 minutes. Everyone is fresh and going as hard as they can to try to either get away or to stay on. It is in these first 5 minutes that I always feel so terrible that I feel like I'm going to crack and fall off the back, but I must remember that is is ALWAYS like this and that it will get better, and sure enough it did. When the 5 minutes were over I found myself on the wheel of the leader and turned back to see carnage all down the road behind me, as he started to lose power and ease up a bit I was able to recover and come around to take the lead. Though we were in the same race, he was a 45+, so we were racing for separate prize money, so we worked together for a bit, trading pulls, until I took a long hard one and opened up a gap. This is always my favorite part of any long climb, when I'm able to ride alone and set my own pace for the rest of the way up. With about 3K to the top I just drove it as hard as I could, and powered over the summit and down the road to the finish in the ski resort. I felt like I was in a big European stage race with the lead car and race photog on a moto in front of me, support vehicle behind me, and even a few crazy guys with cow bells on the side of the road. I pushed it all the way in, trying to get every possible second back on the GC leaders. The next 35+ across the line was the GC leader, 56 seconds back, but the guy who had been second was 1:44 back, so now I was 2nd with an 11 second lead on 3rd, but still 1:28 down on the leader. The team celebrated with Cibelli’s pizza and Oregon microbrew on the Pizza Man’s tab. When I ordered 5 large Pizza’s for the team I wasn’t sure it would be enough, but when I went to pick them up I about fell over. I had never seen 24” pizzas before!! This was great since we had plenty of leftovers for the 9 hour drive back to SF. Stage 4 – 63 mile circuit race – 4 x 15+ mile loop with 2 main climbs of about 3-4 minutes each, but lots of small rollers (and full road closures!). Being the final day, everyone left desperately wanted any piece of the pie they could get, so attacks were non stop from the start. The GC leader was keeping his eye on me, and I was keeping my eye on 3rd & 4th in the GC. Most of the attacks were from guys way out of GC contention, and when my teammates would pull them back in they would say “don’t worry about us, we’re way down on GC”. Sure, but this is still a race and we all want to win it too. On the 3rd lap, I went to the front on the bigger climb and really drilled it, trying to drop as many remaining riders as possible, and by the top we were down to about 10 guys, with 1 and 4 in the GC still on, but 3rd in a chase pack. I waned to pad my 11 second lead on 3rd as much as possible and 4th wanted to move up to 3rd, so the 2 of us did 90% of the pulling for the next ¾ of a lap while everyone else sat on. But, it wasn’t enough and the chase group of about 15 led by #3 pulled us back. That was OK though, we still had 1 climb to go. I was feeling good, so on the final climb I again tried to blow up the 25 man pack, but was only able to drop about 10 guys. I stayed in front just doing tempo and attacking on any little roller over the last 5K, but everyone was just sticking to the wheel in front of them like glue. I drove the pace until about 400 to go when the sprint for the finish began and almost everyone went by me. I finished with the same time and secured my 2nd place GC finish. I can’t give enough compliments to the race organization for putting on such a fantastic event. I’ll definitely be back with a TT bike! Last edited by Pizza Man; 07-16-07 at 11:55 AM. You taking some time off? Things have gotten ugly around here with all the guys peaking for Nationals. District's is going to be downright hostile. Just a couple days, then I have to start getting ready for Districts, then the final push for the Cal Cup races and Mt. Tam, and if I'm not burned out after that, maybe Everest Challenge. Which one is you in the picture? Congratulations and good luck in your next race. Congrats Pizza Man! Hey, doesn't Zimbelman ride for Z Team too? Man... to beat Chris Hamilton too. GREAT JOB! Yes, Zimbleman rides for Zteam too, but he was in PA winning the 50-54 TT Nationals. I've got to ask him for some TT tips. We hope to come up and join him for Mt. Hood next year. Like a koala in a eucalyptus tree, the natural habitat of the PM. The riders on the racing forum never cease to amaze and inspire me. Very nice PM!